The other night we attended a Christmas party at a neighbor's home. Santa was there and it was a bit eerie because there weren't a lot of people and it was very quiet and subdued. 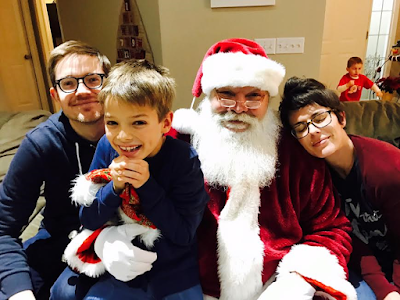 I realized that having a Santa visitor really creeps me out and when they enthusiastically asked if we wanted a family pic with him, I was hesitant. But I responded with a trying-to-joke-about-my-evident-reluctance tone of "suuuure!" Even though I'm not sure it translated, as all other people were quite happy to participate. Julian showed his own feelings of unsurety but coupled with intrigue. He himself sat on Santa's knee and I was dying watching him, for some reason. Probably because he's probably too old for it and looked kind of weird. But I think also because I was watching him wrestle between wanting to believe but being not sure why he should. And it was just really funny to me. Later, when Santa was getting ready to leave, Julian asked me, quietly, excitedly, where Santa's sleigh was? Was he going to call the reindeer and they'd come out of hiding to pick him up? He wanted to trap him. Julian said he had actually gone out to call them to see if he could find them but couldn't remember all their names. I told him, "well I know them, you should have come and gotten me!" So, theorizing that if we pretended to be Santa they might come out, we both went outside and gave it a try. Holding our bellies in a low "ho ho ho!" voice, "Well, that sure was fun talking to all those boys and girls-- On Dasher! On Dancer! On Prancer! On Vixen!" And we waited. And waited. And searched.